Social platform integration – Which platform is right for you? Although I’m a fan of integrating as many social platforms as possible in external sites and application, it’s clear that marketers are sometimes forced to focus their efforts and budgets on one platform or the other. Having a clear strategy and goals in place can help make smart choices. For example, if you are planning on integrating social authentication in your site or app you will probably want to consider a wide range of authentication providers, including Google and Yahoo, but if your focus is on sharing user activities and driving traffic, you are probably debating whether you want to integrate Facebook, Twitter or both. In this post, I’ll try to focus on driving traffic to external websites and applications and compare between the two platforms. Facebook has 600+ million users, compared to 180 million Twitter users. But is user reach the critical factor in deciding which platform you should integrate more tightly? it really depends. A young startup that is trying to maximize traction and word-of-mouth, targeting tech-savvy early adopters with minimal costs, might consider Twitter as your top option, while a mature brand, which targets teens, will probably consider Facebook as a top priority. The fact that there are so many Facebook users out there is not always positive. With Facebook you get a larger audience that includes consumers that might not be in your target segments. This requires potentially leveraging targeting technologies to reach the right audience and you might need to put in more effort in outreach to drive clicks. On the other hand, Twitter conversations have gaping holes in the middle, often leaving Twitter users hanging with just bits and pieces, and leaving them with quite a bit of questions. This could potentially be a con for the brand conversation you are trying to develop on Twitter. Also, Twitter have had a history of security breaches and uptime issues that are just trouble for services that integrate with them. The relatively new Twitter interface that includes the split screen and view pane design is good for marketing. Businesses can effectively share updated videos on their Twitter profiles, instead of just repeatedly tweeting messages, and users are potentially better exposed to those messages. Twitter’s audience is more tech-savvy. with third-party applications through and features such as scheduled tweets and searches and with only 140 characters, a lot of tweets leave readers waiting for more. This factors into a desire to click on more links and drives click-through rates per items posted higher. For B2B marketers, Linkedin might offer an interesting opportunity as well. Back in April 2010, the business-oriented social network gave users the ability to follow companies in addition to following users. Even before that, Linkedin added newsfeed activities, such as “like” and “comment”, very similarly to Facebook’s newsfeed, and enabled users to integrate their Twitter accounts into their LinkedIn feed. My overall feeling (unfortunately, I don’t have any data to back this, it’s just a hunch) is that all those features have substantially increased user engagement on the platform. LinkedIn, like the other platform has API in place that enables sharing links, and as professionals spend more time engaging with LinkedIn, I wouldn’t be surprised to find that the platform can deliver good results in driving interest for business products. To summarize, choosing Facebook because everybody else does it is not always the right answer. One best practice would be to have a clear understanding of your target audience and use publicly available data to figure out in which platform your core audience spends more time in, helping you deliver more bang for the buck. This entry was posted in marketing, Social Media, Social Networks, Web on December 20, 2010 by Itamar Novick. 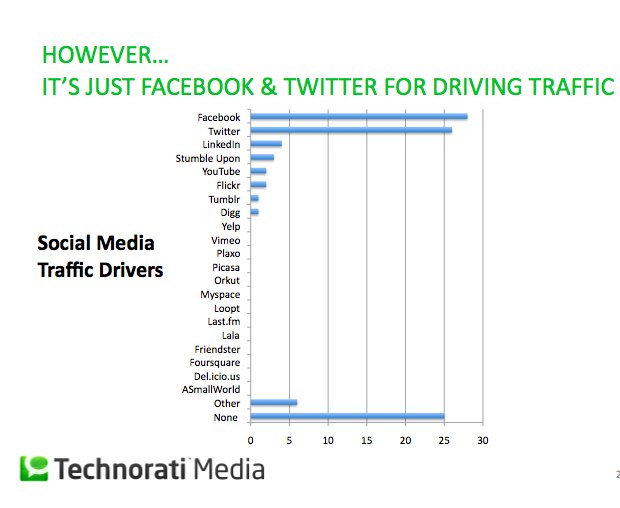 Which social media platforms drive most traffic into websites? Although I guess this is wide spread knowledge for most Social Media professional, I think it’s worth discussing some of the stats about Social Media related traffic on external web-sites from a different point of view (note: “external websites” in the context of this post are traditional non-social network sites). The data, which is probably focused on the most important goal for marketers and website owners – driving traffic from social networks to their sites, shows that the mass of traffic is driven by Facebook and twitter. It’s very conclusive – Facebook and Twitter are by far the most effective platform to target, but there are two good questions to ask are: to what extent is this true for websites implementing social connectivity strategies? and is this traffic content related? Moving forward, I assume that Google, Yahoo and most of the platform above, would do a very good job in prominently showing social activities on their platforms to promote content discovery and outbound clicks. everybody would have a “stream” – This is a must for those platform to survive in a world dominated today by Facebook and Twitter. If that actually happens, some of the marketers might find it more effective to promote user activities on other platforms, as they would offer a lower “price”. Assuming that each item shared by users has some “cost” associated with it (especially if it is an incentives share) an interesting data bit for marketers would be the the cost of a lead gained from sharing activities or advertising in all other platforms. This indicates that users actually share and authenticate using diverse Platforms, if they actually are given a chance to do so (depends on whether the website has implemented sharing and authentication to other destinations). The data actually drives right into the heart of Gigya’s value proposition – enable users to choose which destinations they want to connect and share to, and then track and optimize the conversion rate of share to traffic to realize which platforms are effective in driving traffic for your site. I’m guessing some websites would experience that the distribution of users authenticating and sharing by platform varies according to the site’s content and target audience. If your website targets an older demographic user segment you may find that Yahoo and Linked-in are actually a favorite connectivity destination for your users, potentially leading to lower costs associated with acquiring leads from those platforms and making them an important part of your social marketing strategy. This entry was posted in marketing, Social Media, Social Networks, Web on November 16, 2010 by Itamar Novick. Intense discussions about the new era of Social in web and mobile have been all over the place this week. Those discussions are, rightfully, getting tons of media traction. It started with the announcement of the new sFund from VC Kleiner Perkins Caulfield & Byers, who joined hands with Facebook, Amazon.com, and Zynga to announce a new $250 million fund for social networking startup (You can read more about that here: http://www.businessinsider.com/live-facebook-to-announce-new-vc-fund-2010-10#ixzz13DmAQGTd). The new fund met with some criticism led by Chris Dixon, a leading angel investor, who kept shredding Kleiner Perkins initiative on twitter (you can see his tweets here: http://twitter.com/#!/cdixon). Chris basically suggests that Kleiner’s dedicated social startup fund is late to the party. Nobody has yet to figure out how to successfully use Social Media for e-commerce. It’s clear that this is one of the Holy Grails of Social, yet no disruptive solution or technology has showed up. Not only have we not seen the first generation of successful Social solutions for e-commerce, we aren’t even seeing beta solutions that deliver solid value. Unlike Brand Marketers, online retailers want performance based solutions and are willing to pay handsomely for leads that convert into paying customers. Social Network brand marketing tools have made a huge leap forward in the last year, but there are many optimization challenges ahead. This space is young and growing and we will surely see more disruptive technologies that would grab more advertisers’ dollars. Chris surely recognizes that those opportunities are out there. True, Social is not all new and it’s already here, big time, but the industry is still pretty young and will probably see a lot of game changing products in the future. Unfortunately, it took a long time for players in the industry to understand where there are headed to and what works best, but now as some of the key concepts are unveiled it’s officially the first round of the new web – the social web. Round 2 and maybe 3 are probably around the corner and it seems that there are many opportunities out there for entrepreneurs and venture capitalists. I would bet a small amount of my money on Kleiner Perkins Caulfield & Byers new sFund. Would you do the same? This entry was posted in marketing, Social Media, Social Networks, Web on October 23, 2010 by Itamar Novick. According to WSJ Yahoo are making an effort to take their Social Strategy seriously, again. They are launching a new service called Y-Connect, aimed at media sites and publishers with the end goal of bringing more traffic. TechCrunch and Blogs around the web are just all over the place talking about how Y-Connect will fail, but I’m more interested in asking what they need to do to succeed. The world needs more than one social network. Competition is healthy for everybody and although Facebook are doing a brilliant job so far, competition will only make this space better. OK, so authentication with Yahoo is great. Being the biggest email provider in the world, Yahoo has more than a handful of user accounts and that could help boost activity. However, social optimization platforms, such as Gigya, have already been using Y!OS for over a year to authenticate users on external websites (checkout answers.com, a really cool integration), So what’s new here? Yahoo cannot honestly expect publishers to switch their existing Facebook Connect button (which is already on over 1 million sites) with Yahoo Connect. At best, they will add Yahoo on top of their existing Facebook and Twitter buttons. Taking into account that users only need to login once, Yahoo needs to work hard on making sure that users log-in with Yahoo first and not with other buttons. If Yahoo gets the User experience right on those buttons and make it as seamless as possible it could work, but it has to be better than Facebook connect. It has to be “seamless”. What I mean by “seamless” is that signing into an external site using Yahoo_connect would be easier, smoother (less screens, and preferably using a dialog if possible), and overall a better experience than doing the same with Facebook connect. It has to be so good that users will prefer using Yahoo-Connect than using Facebook Connect .Otherwise, people will just go on using their existing Facebook connect buttons instead of using the new Yahoo Connect. That is probably the key to success here. User authentication is great, but publishers need an effective social media strategy that brings in traffic. The issue is that Yahoo hasn’t been able to deliver that just yet. Yes, users have a profile in Yahoo. Yes, they have a Social Graph (very much like Google Buzz the relationship graph is related to their email connections), but for the social sharing piece to work, Yahoo has to help users to interact with each other and interact with friend’s feed content. If Yahoo wants to get serious with their Social Strategy (and it’s not too late to do that yet), they have to feature the feed items on the Yahoo front page (for logged in users). To me, this seems like the only way to play the game to win. I know it’s hard as Yahoo front page is one of the most valuable web assets in the globe, and I totally understand why Yahoo is sometimes reluctant to change something that clearly works, but this is what innovation is all about. Change. If Yahoo wants to play the Social Network game to win it has to adopt and promote their Social Media Strategy by doing more than PR. They need to help users discover that Social functionality in Yahoo and make it an integral and prominent part of the Yahoo services suite, just like emails, News, Finance and other successful Yahoo products. This entry was posted in Social Media, Social Networks, Web on October 19, 2010 by Itamar Novick. Watching “The Social Network”, regardless of whether the stuff they show there about Mark Zuckerberg are true or false (or somewhere in between), you can’t help but think it’s a great movie. Also, it made my mind race with a few thoughts. It’s one of the first movies (if not THE first) that illustrates the web 2.0 start-up world. Hollywood has been slow in recognizing the impact of web entrepreneurship on the world and even more specifically on the lives of Y-gens. I hope that the movie’s success will result in more movies about entrepreneurship in the Tech world. Another thought is that this movie pitches, not directly, that quitting school is a good thing. Although they don’t discuss it at length, the movie signals that if you are the next Mark Zuckerberg you should quit school. Okay, so a classic counter argument would be that 99.9999% of the population are not the next Mark Zuckerberg, but as quite a few academic researches show, most people have a confirmation bias about themselves and think they are capable. It’s interesting to note that thoughts leaders are also pitching dropping school. Last week a group of students at UC-Berkeley (including me) got quite a treat: a lively discussion with TechCrunch founder Mike Arrington. Arrington was very direct, and said that the kind of person who wants to increase his chances of success by getting a masters degree isn’t an entrepreneur; older entrepreneurs have no chance of raising money (so they’re a lost cause). Overall, I think that “The Social Network” is a good thing. This movie and others that could follow will help spark innovation and push more entrepreneurs to get out of their comfort zone and do what they believe in doing. This entry was posted in Social Media, Social Networks, Web on October 3, 2010 by Itamar Novick. It started out with Mark Zuckerberg’s letter about upcoming changes (which had quite a few blah blahs about controlling your data’s privacy) focusing on dropping the regional networks and privacy-per-post, but somehow ended up very differently. Who knows? Maybe the plan was to have this one slip through the community by sparking up the conversation about privacy-per-post, but Facebook also included an opt-out Privacy Settings wizard, which all 350 million users saw, making user’s Status Updates and Newsfeed items public. Anyone who has a bit of User Experience knowledge knows what a long, boring privacy settings, opt-out form does to users – they just confirm or skip, whatever is easier to click. Most users don’t even bother spending the time tweaking their privacy settings, they probably wouldn’t bother opt-out either, and whoops their posts are now open to all. Open to all means a lot of things, it means that posts are now open to anybody who finds you through another Facebook friend, but it also means that it’s indexable – any search engine or crawler can now tap into your Life stream. And the search engines are all over it. According to Tech Crunch Bing will be getting access to Facebook public stream in early 2010. Google will only access Fan Pages at first, but I bet they will go out of their way, including paying cash, to index users’ streams. I guess the very legitimate discussion about this shift in the user’s privacy would probably go on and on inside Facebook and outside it, with many who will go against it, but it’s hard for me to believe that Facebook would take a step back. 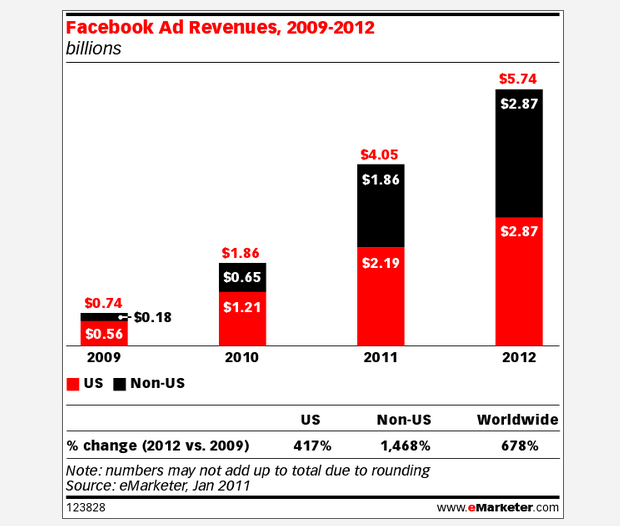 This is a huge opportunity for Facebook, and an important step before shooting for an IPO. “Selling” all this data, and creating an eco-system of developer’s around it, can probably turn out as a revenue hit and may bring Facebook to a point where it’s break-even or even profitable. It’s also an interesting opportunity for publishers and application developers, who can increase engagement by displaying and aggregating Newsfeeds, if Facebook allows them. This entry was posted in Social Media, Social Networks, Web on December 12, 2009 by Itamar Novick. The Social stream has already been recognized as a major factor in the evolution of the Social web, a force that is able to change the way we communicate in the virtual world (why shot an email about amazing Susan Boyle when you can easily treat all your Facebook friends with her full screen video?) and consume the most recent and relevant content out there (Honey, you won’t believe it – Ashton just tweeted a picture of pregnant Demi in a bikini!). Now Social Networks are warming up their engines for the next big step in Social Streams – syndicating streams. Both Facebook and Twitter, arch-rivals in the real-time Social Stream arena, have lately made important progresses to help users better experience the web by taking their social connections along with them for the world wide web ride. The recent blur of the boundaries between Social Networks and traditional sites is also a huge opportunity for traditional sites to step up and make their user experience more social and engaging. Earlier this month Facebook made an important announcement involving its “Open Stream” strategy. Facebook now enables site owners and application to tap into the user’s newsfeed stream and leverage it in their site or applications. The new set of API, which is already accessible, allows retrieving the complete user newsfeed stream, including all the data bits that are contained in a feed item (such as images, user’s information, comments made, “likes” and more). Furthermore, in Facebook’s March 2009 profile overhaul they have evolved the stream to be semi real-time and included filtering options. Both of those features are reflected in the new API set, opening up an endless number of opportunities for developers to incorporate the real-time stream in their site and applications. Off course, Facebook are also working hard to fight one of the major showstoppers for this new (and arguable disruptive) technology – privacy issues. To avoid any misuse of the user’s data the requesting application must receive an authorization from the user, and only than can it access the user’s social stream. They have also added another restriction – applications are only allowed to get data from the last 24 hours, to stop data miners from hosting a critical mass of data about users. This entry was posted in Social Media, Social Networks, Web on August 2, 2009 by Itamar Novick. How big is "connect" technology – that big ! Almost a year ago we heard quite a hype about Facebook Connect, Google Friend Connect and Gigya Socialize that are supposed to connect the Social Web with the regular website (some nice links can be found here and here). But since than it’s been quiet on this front, and for no obvious reason. Now, you must be wondering what’s up with all those “Connect” technologies (at least I am), and the truth is pretty surprising… It’s silently creeping up everywhere! 1) Authenticating users (OpenID style, but with Social Networks). So, previous attempts at having a one “Universal identity” have failed, but Social network identity is a different story. It includes the user’s personal ID but also connected to the user’s Social Graph. 2) Virally promoting the site via newsfeed items, status updates and other tools. This is rather a new option for more publishers, with clear untapped potential. So what about the bottom line – is it working ? “In the four months the site has been testing Facebook Connect, 94 percent of reviewers have published their reviews to Facebook, where an average of 40 people see them and 70 percent click back to Citysearch. That has translated into new members: daily registrations on Citysearch have tripled. In other words, each item shared through Facebook Connect generates 40 impressions and 28 unique visitors – a lot of traffic per shared item”. Those are pretty amazing numbers and I think the main reason for that is that it’s truely viral and is user initiated. If I were a site publisher I would seriously consider this data. It may not have the glam and glory of a hype, but it does magic in getting exactly what sites need – increasing site interaction and traffic. This entry was posted in Social Media, Social Networks, Web on June 20, 2009 by Itamar Novick.